About 80% of a new Emergency Services tax would go to fund the Po-Mar-Lin Fire Company, but one supervisor, Robert Weer is arguing that the rate should be higher than proposed. EAST MARLBOROUGH — The question of how and how much to support local protection is likely to be a prime topic of conversation when the township finalizes its 2012 budget next month. 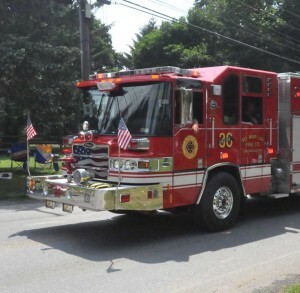 While it’s clear that the township will implement a specific Emergency Services tax in the coming year — similar to the specific taxes levied for the library and open space — there was some disagreement about how much that tax should be, amid concerns that some local fire companies, such as Po-Mar-Lin and Longwood are struggling to keep in operation. The number in the preliminary budget passed last week calls for a tax of .30 mils, which amounts to $206,400, but supervisor Robert Weer called for a rate of .55 mils, which would generate about $376,000. Weer suggested trims from elsewhere in the budget, so that the net rate wouldn’t for taxpayers change. Po-Mar-Lin would stand to get about 80% of those funds, with Longwood getting the rest, as the former covers much more of the township for fire services. Despite the lack of a direct tax, the township has been funding local emergency services out of the main budget, spending $176,000 in 2011, meaning the new tax would increase emergency services spending by $30,000. While Weer acknowledges that the additional funds will help, he cautioned that they might not be enough, suggesting that Po-Mar-Lin, where his son John serves as company president, is having a tough time making ends meet. More frustrating, the elder Weer said, is that he feels the township has to carry a larger burden for paying for fire safety than the neighboring towns that are supposed to also support the companies — particularly when it comes to Po-Mar-Lin, which serves parts of township, as well as neighboring Newlin, West Marlborough and Pocopson. “East Marlborough residents bear a disproportional share of the cost for fire protection,” he said. Po-Mar-Lin and other local companies have been hit by a loss of manpower — with the tight economy and many people forced to work additional hours, either to make ends meet, or out of fear of losing their job — there have been less people available to work on non-emergency response issues such as fundraising. That’s hurt the bottom line for the company, already working to pay off the costs of their new building. Po-Mar-Lin was also hurt by the loss of revenue from a proposed cell tower and rental of their old building, Weer said, both of which met with local neighborhood opposition. Local residents objected to the cell tower and while the township has given an additional annual $18,000 stipend to the company to make up for it, it’s likely that additional revenue, from additional cell antennas added once the tower was built, was lost. The company also lost rental income of the old fire hall (located next to the new building) when neighbors complained, Weer said. While his colleagues acknowledged the need to fund the fire companies, they seemed a little more reluctant to double what the township is currently paying. While Weer acknowledged the difficulty of raising taxes, he argued that his colleagues should consider reallocating spending away from other areas — including public works and snow removal — to better fund emergency services. “I think in today’s world, we need to think differently,” he said. While the final budget numbers — and the final millage for the emergency services tax — won’t be approved until the Dec. 5 supervisors meeting, Weer was the lone supervisor to support a .55 rate. All four other supervisors voted to keep the .30 rate in preliminary budget adopted last week. Ha!!! another Steve, but I had similar thoughts. Mr. Weer has the right approach. I remember when the tower issue (and the money it would have generated for the fire company) was opposed…didn’t realize neighbors were against them renting out the old hall!!! maybe time for the neighbors to help out. I’m afraid that the old addage, pay me now or pay me later will come into play if the fire company closes it’s doors in this community. Wonder what our taxes would be for paid responders!!! Instead of coming up with yet another tax, wouldn’t the $235k they have spent “planning” a 1 mile long bike path on 82 in front of the high school (“the path to nowhere”) that benefits hardly anyone have been better spent on emergency services that benefit everyone?